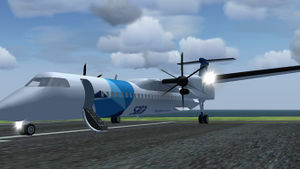 The Bombardier Q400, also known as the Bombardier Dash8 Q400, earlier DeHavilland Canada DHC8-400, is a short-haul twin-engine turboprop airliner originally build by DeHavilland Canada, now by Bombardier Aerospace. 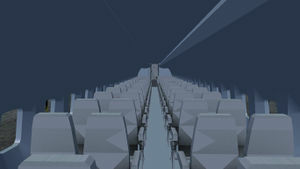 90 Passengers can maximal seat in its cabin. According to Bombardier it can fly almost as fast as a jet while consuming less fuel. 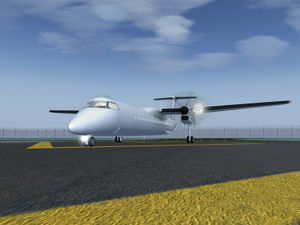 It uses two Pratt&Whitney 105A engines combined with six-blade propellers. Cockpit modelling Quite well done although some panels are missing and not every switch is animated. FDM Done as much as I'm able to. Maybe a JSBsim FDM later? This page was last modified on 23 June 2017, at 04:44.